The final days of 2016 offered up a few more opportunities to make some option moves so I went ahead and made a few more moves right before the end of the year. In mid-December I went back to Stryker Corporation in the search of option premium. 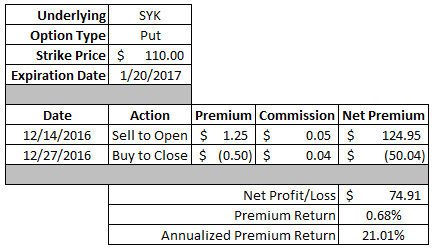 Stryker has recently been offering solid premium for the amount of discount that I want so I figured why not sell another put option. Since I had to buy the option back in order to close the position I didn't get to keep the entire premium that I originally received. However, I was able to capture 60% of the premium which is my typical target for premium capture to close out a position. The net profit worked out to $74.91 which is a 0.68% return based on the capital to secure the put option. On an annualized basis that's a solid 21.0% return. I've been a fan of J.M. 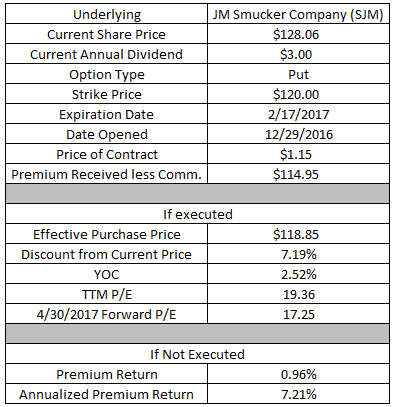 Smucker the business for a while now; however, the valuation never seems to line up with my available cash. It's currently still a bit more expensive that I'd like to purchase shares although it's getting in the ballpark that level. The $120 level is around the high end of what I'd be willing to buy shares at so I went looking through the option chain to see if there were any potential combinations that are close to my 10/10 put selling strategy. If J.M. Smucker's share price falls below $120 then I'll have to purchase 100 shares at $120 per share. However, since I received the premium payment up front I get to reduce that from my purchase price giving me an effective cost basis of $118.85 per share. Currently the share price is trading at $128.06 so this would represent buying shares at a 7.2% discount from the current price. At a $118.85 per share cost basis the yield on cost based on the current annual dividend would be 2.52%. On a TTM basis the P/E ratio would be 19.4x and looking forward to FY 2017 which ends 4/30/2017 the valuation would be 17.3x. If Smucker's share price remains above $120 then I'll get to keep the option premium as profit. Based on the capital required to secure the put option that would be a 0.96% return or 7.2% on an annualized basis. If you recall back in November I was semi-forced to roll my covered call position on Target up and out. Target had announced what I considered to be so-so earnings yet it was well received by the market sending shares higher by over 7% in one day. Of course as luck would have it that was less than a week until the expiration of my call option leaving me with little room to navigate since it was well past the strike price. I rolled that call option up and out which was giving me a much better effective sale price and would have potentially led to a gain via the option premium should the option expire out of the money. Although in order to do so I had to move well out in time with the rolled call's expiration moving out to the April cycle which isn't ideal at all. Since rolling that call option I was looking for opportunities to roll the call option again; however, this time it would be down and in. Target's share price has drifted back down and now sits just over $72 which opened the opportunity to roll the call again. The original call option that I had to roll out and up showed a net loss of $323.74. Luckily the second call option, the $77.50 strike, showed a $218.26 profit. As you can see the net premium from the call option is still sitting at a net loss of $77.28 so there's still a lot of work to do to try and turn this into a winning move. While the premium is still showing a net loss the good thing is that I still own the shares so if the open $76 strike call option expires I can sell another one to continue to generate income and eat away at the loss and eventually turning a profit. Despite the net loss via the option premium my total gain is much better than the original call option since my strike price is $2 higher than the original call option. The rolling down and in of the call option isn't ideal since I'm still showing a net loss via the option premium; however, I feel much better about this call option than the $77.50 April expiration one. Frankly there was way too much time for that call option than I'd like since I typically aim for 30-60 days out. Based on the options market the $76 strike call that is currently open has about a 16% chance of being in the money meaning there's an 85% chance it remains out of the money. Only time will tell though but I'm happy to move the expiration date in to the January options cycle. Since I only collected a $28.20 in premium I'll likely have to wait until the week of expiration to try and close the call option or roll it forward to collect more premium. My broker allows for zero commission closing of option positions during expiration week if the cost of the option is $0.10 or less. In December I was able to generate $793.32 in profit via closed/expired positions. Considering I earned slightly over $900 from dividends during the month with significantly more capital I'm pretty happy about the results. For 2016, I earned $1,019.73 in profit via option premium. Since that was done in just 4 months I can't really complain. I've updated my Option Summary page to reflect this change. 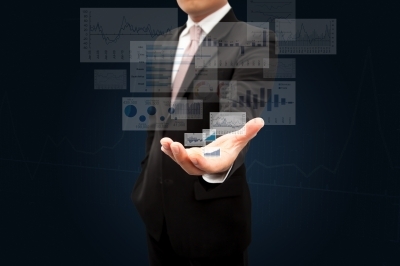 Do you incorporate options into your overall portfolio strategy? Have you ever had a call option go against you that you had to roll out and up? Capturing 60% of the premium is fantastic I usually buy my contracts back at 50% profitability so this trade would've been just fine with me. My normal target is around 50% although that does fluctuate depending on how long until expiration and how far out of the money the position is at the time. But generally I aim for the 50% level as well.